Where is it? : The Goolwa Barrage is about 5.5km SE of Goolwa. Parking is available here or at the Beacon 19 car park. 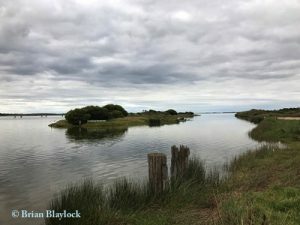 History: This area was added to the Coorong National Park on 23 August 2001. Habitat: Most of the area east of the Goolwa Barrage is open salty water with a narrow strip of land along the edge of Sir Richard Peninsula with areas of Lignum (Duma florulenta), Beaded Samphire (Sarcocornia quinqueflora) and Coast Bonefruit (Threlkeldia diffusa).